Namibia stands for endless horizons, wilderness and beautiful natural settings. An excellent way to experience the stunning nature of Namibia is to go on a mountain bike ride through these wide and mountainous landscapes. We laid out different trails on our land which cater for intermediate to advance mountain bikers and guide you through the wild romantic scenery of the Aus Mountains in Gondwana Sperrgebiet Rand Park and the neighboring Farm Kubub. Our trails lead you through the impressive biodiversity, geology and historical sites of the area. Explore the flora and fauna of the Succulent Karoo desert on your own. The landscape on the trails is characterized by granite gneiss outcrops, rugged valleys, meandering dry river courses and vegetation of the Succulent Karoo which is one of the most diverse desert biomes worldwide. The altitude varies from 1250m to close to 1700m.a.s.l. Cyclists will be able to spot klipspringers or the occasional kudu en-route, but the grand vistas over the Namib are by far the highlight. There is a choice of different routes and lapses: varying from 18km to 60km. The trails mostly consist of narrow challenging single track paths as well as jeep tracks through the Aus Mountains. The single track routes also follow the hiking trails. Please be careful when approaching hikers on the trails. The Jeep tracks used to be historic transport routes and were built by the Schutztruppe during World War I. With the help of mules and oxen provisions and water were supplied to the entrenchments at the western foothills. The fortifications (ramparts and trenches) can still be seen today. All bikes are fitted with a multi-tool kit, compressed CO2 cylinder with tyre inflator device. Helmets are supplied at no charge. Bikes have tubeless tyres filled with a tyre sealant, no spare tubes supplied. Rates: N$ 400 for daily hire from 7am till 7pm. Note that the park permit is not included in the rental rate. Damages to bikes including tyres are for your account: Please double-check that all is in order before you depart on the trip. Leave the parking area at Desert Horse Inn, cross the railway line and follow the district road for 2km to the town of Aus. Pass the Catholic church and cross the railway line onto the tarred road. Where the road forks go straight onto the gravel again, ride for 500 m and once you pass the last house on the right you will see the white arrow to turn right to the Aus reservoir. Pass the reservoir to reach the gate to the farm Kubub, carry on riding for about 7km to the junction indicated as water point A on the map. Turn right to continue on the jeep track for 3.4km. Before reaching water point B you will descend on a steep tricky downhill track (the downhill signs will warn you) - please take care. At the junction at the water point B sign you have the option to either turn right in order to follow a taxing 7km single track past the campsite back to Desert Horse Inn (a loop of 18km). For a longer ride, turn left to follow a wearing 4.7km climb on a single track after which you reach the Nemesis viewpoint. Stop and enjoy the grand vistas. After this breath catcher, continue on a short downhill stretch. Then sharply turn right and once again follow the single track climb. You will reach a steel bridge which you have to cross (for those who are not comfortable – please rather get off the bike and lift your bike over the fence). From here, continue to climb for another 500m to cross another wooden bridge. Continue on a single track which follows a mountain ridge with one steep climb and then descend in a westerly direction towards Nemesis. 300m before Nemesis make a sharp turn to the right and continue on a flat single track for 2.5km in order to reach again the junction indicated on the map as water point A. Turn left to continue again on the jeep track for 3.4km, to reach the water point. At the junction, turn right to follow a taxing 7km single track past the campsite back to Desert Horse Inn. At the Campsite you have an option at kilometre 30 to deviate left in order to add another 12km of farm road past Eagles Nest to water point C. Expect a very steep tiring technical climb from kilometres 42-44. Be prepared to push your bike for 150m on the first part of the climb. At Water point C turn right and follow the track to water point A, then B past the Checkpoint to the Finish at Desert Horse Inn. You have completed at 60km ride!! Leave the parking area at Desert Horse Inn, turn left before the railway line and follow the orange arrows in the direction of the campsite. Pass through a gate and at the junction turn right and then left to start with a 5km single track climb in a southerly direction. After entering through another gate, you will encounter a steep climb with sharp turns and most cyclists will probably have to dismount and push the bike a bit. Carry on for another 1.3km until you get to a junction with a sign water point B: turn left and attack a steep climb for the first 300 meters. You are now on the historic German transport route. Follow the track for 3.4km until you reach another junction indicated as water point A. If you decide to turn left and to follow a 7.5km down-hill stretch through the village of Aus, you will have completed a loop of 18km upon return to the lodge. If you decide to go on a longer ride, please turn right at the junction towards the granitic outcrop of Nemesis. About 300m before the Nemesis view point, turn left and follow the 5km single track, crossing a wooden bridge. Just before reaching the second bridge you have the option to descend on a very tricky 2km steep down-hill stretch to the foot of the mountain. Beware this is a very rough downhill! Follow now 12km of farm road past Eagles Nest to the farm reservoir, then follow the orange arrows to the sign indicated as check point. Turn right to water point B, then follow the arrows to water point A where you turn left to ride back through Aus to Desert Horse Inn. You completed a loop of 45km. The 2nd option at Water point C would be to carry on over the steel bridge until you reach the Nemesis view point. Stop and enjoy the sweeping vistas over the desert. After this break, carry on straight on a technical downhill track for 5km in order to reach the junction indicated as water point B. Turn right onto a steep 300m stretch in order to reach the junction indicated as water point A for a second time. Turn left and follow the 7.5km down-hill stretch through the village of Aus, past Andrew & Sons, Namib Garage and Bahnhof Hotel. Upon return to the lodge, you have completed a loop of 33km. Please refer to the maps regarding the detailed kilometer breakdowns for the different sections and lap options. 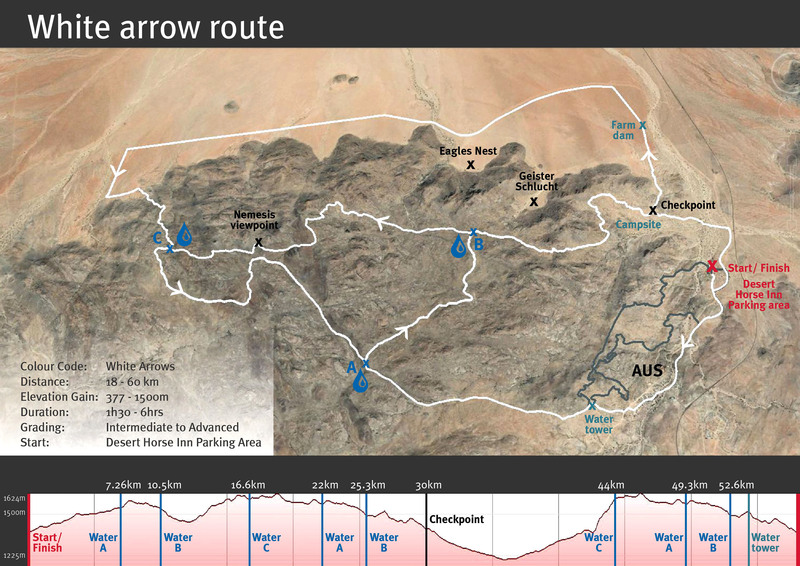 With the help of the map, please pre-plan the length of your route according to your fitness and abilities. Take enough water and preferably cycle with a partner. Remember: These trails are recommended for intermediate to experienced riders. If you are a novice just take it easy and expect to do a bit of walking in-between. Every 2nd year around the end of February, Klein-Aus Vista organizes a Mountain Bike Challenge, where participants can compete in a 3-day stage race. Cyclists can enter for a 132km full-marathon or a 66km half-marathon. The next race ill take place in February 2020. The Time Trial/XOC route is marked on brown mountain bike signs with grey arrows. Please take caution, this is a cross country style track with technical down hills, but is a lot of fun. 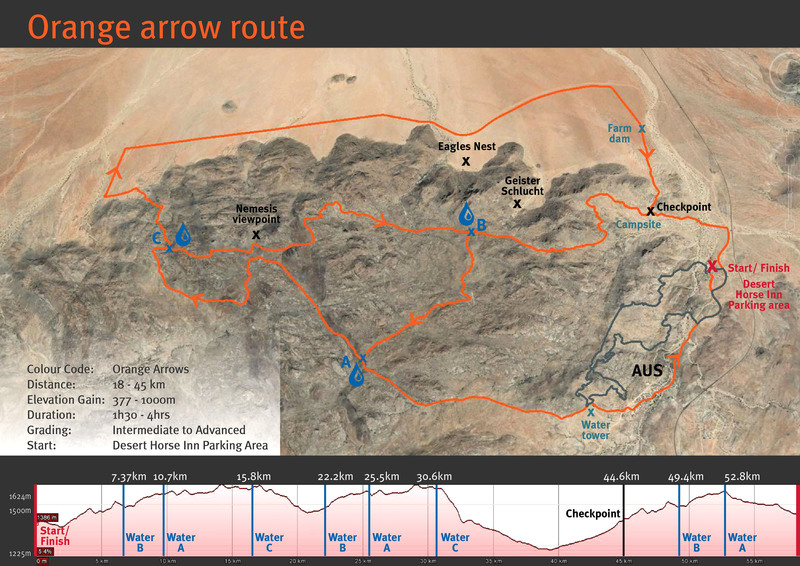 Leave the parking area of Desert Horse Inn in an easterly direction, cross the railway line and follow the district route for 1km until you find a few white drums. Look for a grey arrow sign. Turn right, cross the railway line again and go past the two windmills through the sandy river bed. Now you are on the single track and the fun begins. From kilometre 4 it becomes really technical with short steep climbs and descents on the granite rock slopes. Be alert all the time. When you pass the Aus Water Tower make sure to turn right at the grey arrow. Another 400m of steep climb lies ahead. Once you are on top at kilometre 4, there will be a nice roller coaster descent for 1km through the river bed to be followed by a gradual climb parallel to a fence. The last part is very steep with a sharp bend to the left and plenty of controlled power and concentration are needed for even experienced riders to master this climb. Once on top, give yourself a little break and enjoy the vistas over the village of Aus. Be cautious since you will now descend on a bumpy path over the granite rocks with the last bit navigating some switch backs. The Desert Horse Inn will now be in sight and after a few short climbs you will pass through a gate (please close it). Now you will have a great view on the Inn before dropping into the river bed with two tricky switch backs. Power through the sand to reach the parking area after passing another small gate to finish the ride. Now - tap yourself on the shoulder and have a cold beer, since this track is rated as some of the trickiest in the country.